UPDATE: East Riverfront Station single-track operations is cancelled for Wednesday, Dec. 21. Grand Bridge single track will continue as scheduled. In order to accommodate construction near two MetroLink Stations, Metro will operate trains on a single track three evenings this week. Tonight, tomorrow night, and Friday night, beginning at 8 p.m. through the end of service each night, MetroLink will implement single track operations near the Grand and/or East Riverfront MetroLink Stations. Blue Line service will be modified to accommodate single tracking. Tonight, Blue Line trains will only operate from the Civic Center MetroLink Station to the Shrewsbury Station. Tomorrow night and Friday night, Blue Line trains will only operate from the Forest Park MetroLink Station to the Shrewsbury MetroLink Station. Starting at 8 p.m. until the end of service, Red Line trains will operate on a single track at the East Riverfront MetroLink Station. Red Line service will not be affected. 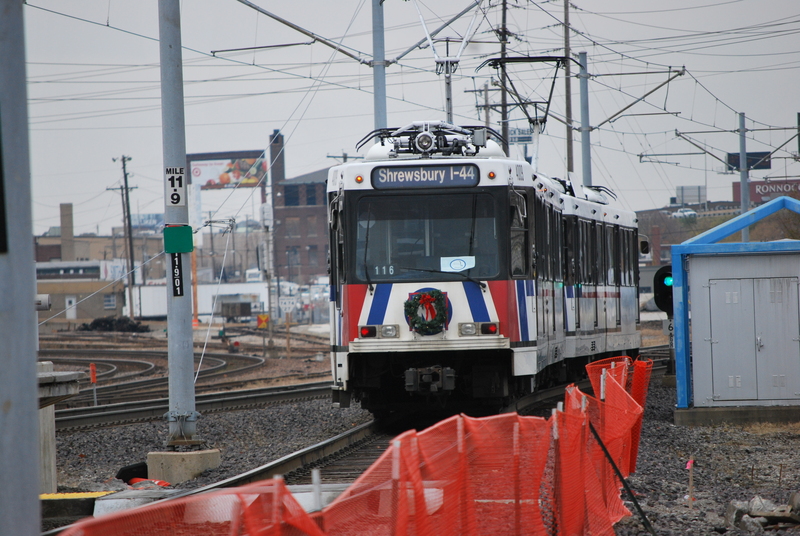 Blue Line customers should allow 10 extra minutes for their commutes.Blue Line trains will only operate from the Shrewsbury MetroLink Station to the Civic Center MetroLink Station. Starting at 8 p.m. until the end of service, Red Line trains will operate on a single track through the areas near the Grand Boulevard Bridge. Blue Line trains will only operate from Forest Park MetroLink Station to the Shrewsbury MetroLink Station. Red Line and Blue Line customers should plan for longer commute times. Starting at 8 p.m. until the end of service, Red Line trains will operate on a single track through the area of the Grand Boulevard Bridge. Red Line and Blue Line customers should plan for longer commute times. Single tracking and cutting short a route can be quite tricky during a hockey game or a football game. Eventhough when the trains are coupled together, they can hadle up to 400 customers. They have seating for 72 adults, but somehow, the stations aren’t designed to take 3-car trains. Plus that screws up the distance computer that’s built into the system. At least most of the time, cutting the lines short in the evenings when there mostly not many riders isn’t that bad. Now during hockey game times and football game times, going to rush-hour scheduling might not be bad and could help control some of the congestion at the stops. If I’m departing from the Shiloh- Scott station, will the metrolink take me to the central west end station? The construction does not affect westbound trains, so you should be fine. Davina, we do not have any planned maintenance work on the MetroLink alignment tonight. Red Line service will operate normally between the Grand MetroLink Station to Lambert Airport.